Federica Bacchetta: "I just had a feeling to retire"
At Aruba Beach Tennis Open 2018 many sensations happened. Among them was a very big statement about retirement of world №2 female player - Italian Federica Bacchetta. There was a very emotional farewell ceremony for her at the central court after the final match. As I heard it - I thought that the one epoch of beach tennis is close to over. 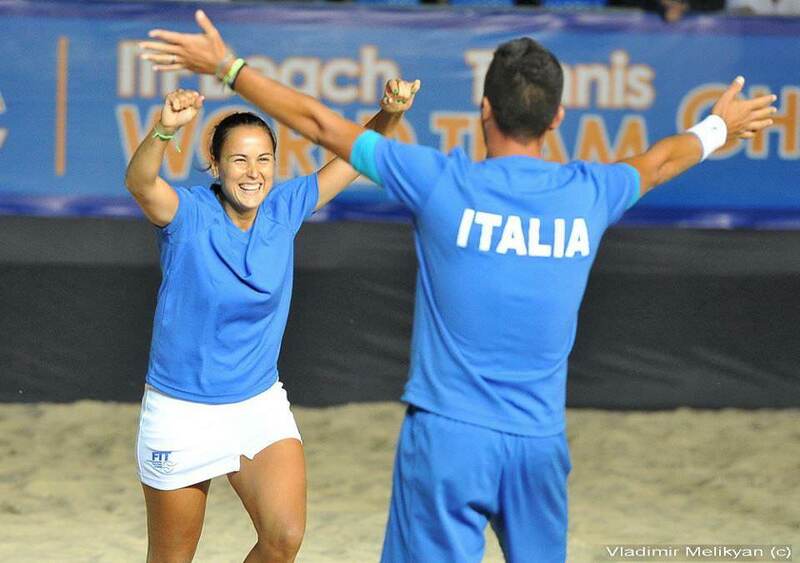 For me Federica is a really extraordinary player whose game style is the best performance of beach tennis itself. Besides she showed us a great example of attitude: respecting her opponents, being true friends with her ex-partners and team mates, staying honest, calm and supportive at the very bad match situations and never giving up. This interview you read is taken from the very best player of female beach tennis… well, in my opinion. When and how did you start to play beach tennis? When I was 14 years old, I was playing tennis and during the summer I did not like it to stay under the sun to do nothing and finally finished up with playing beach tennis with my friends. Who was your first partner and your first tournament? I was 15 years old and played with Cecilia Salimbeni my first IFBT tournament. Tell me about highlights in your career? There were many great moments! For sure 4 victories in World Championship.. each of these tournaments were special. Allso the victory at Aruba Beach Tennis Open 2017. And for sure when we (the Italian national team) won the World Team Championship 2015 against Russia with the decisive mixed match where for Italy played Garavini and me! But I think that each tournament gave me a special emotion! Which match you consider as the best in your life? The best victory was this year at the World Championship because we made a great tournament with Giulia Gasparri. We played very strong matches including the final which was also very tough and at one moment seemed impossible to win but finally we made it! Also the Double Mix tournament at the World Team Championship 2015. For sure the World Championship in Cervia because I play at home and there are lots of people coming to support me! Also this year in Rio was really great! Who is your best partner ? Mixed partner? I suppose I was very lucky because in my career I had very long partnerships with 3 players with who we created amazing feeling inside and also outside the court. First was with Giulia Spazzoli. She was my first “love”. We played together for three years. And won the first World Championship in 2010. Also it was the first year when the players from different federation ( ITF and IFBT) started to play under the same roof (FIT and ITF). The second one was Sofia Cimatti. Together with her we also have been playing for three years, made a lot of battle and won a lot of tournaments together including the World Championship 2014. We also created a lovely friendship and she was my witness for the wedding. Finally Giulia Gasparri. We have been playing together during my last 2 years and I think that we made the best seasons ever. In 2017 we won Italian, European and World Championships. And in 2018 we made the same except the European. Where we were the Runner ups. I think that we have written a beautiful page in female beach tennis. About the Double Mix, for sure my best partner is Marco Garavini, we played together for 10 years and together we won Italian, European and World Team Championship! What do you like to play more: doubles or mixed? I love to play both. But for sure I played more Double than Mix! When you firstly thought about retirement? At the end of 2017 I was thinking about my retirement. We spoke with Giulia Gasparri and my husband/ coach Michele Folegatti and I decided to continue one more year because deep insideI had more energy for spending. But I thought that I would be my last year and during and at the end of each tournament in 2018 I had a different sensation. I was thinking that maybe it could be the last one. And I felt that it is good like this! What is the reason of your retirement? And why you decided exactly Aruba to be your last tournament? I decided to retire at the first place because I just felt it. In your life some decisions are just inside you. You feel that this is a good choice. Right now it became really stressful to play beach tennis at a high level. You have to travel, have to organize the work at home, you have to play each tournament for having points to be in the fourth seeds. After many years I need a rest a little bit, I need to find time to spend with my husband without beach tennis. But I want to continue to train. I don’t want to stop, because maybe I can play some tournaments close to my home. But now I don’t want to have a commitment for all the season and that the reason of why in September I spoke with Giulia Gasparri and told her that she could be free for the next year. And we decide to play the last tournament in Aruba. And really it was the best choice ever. In Aruba they organized an amazing tribute for me, I couldn't stop crying. it was incredible! And after I heard that my husband asked them to make this happen. And then I couldn’t stop to thank him, Aruba organizers and all the people that joined this wonderful moment! Do we expect for you to be back? Maybe.. right now I don’t really know. But for sure I want to continue to stay in the beach tennis world because it is my life. Maybe like a coach. Or maybe again like a player in the future. We will see! !